Click the Start button, click the All Apps icon, if necessary, and click Contact Support. The Windows 10 Contact Support program routes you to the correct department. Online: Some categories simply take you to a website for more help. To its credit, the app usually routes you to the correct place more quickly than you could have done yourself by searching on the Internet. But this option won’t help you if you’re having trouble connecting to the Internet. 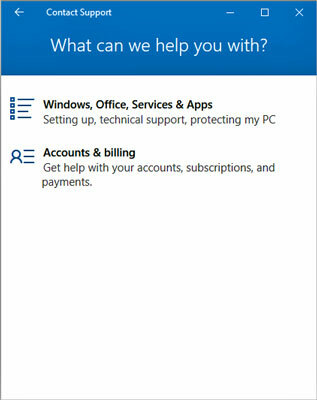 Chat Online with a Microsoft Answer Tech: A good place to start, this begins as a free chat, where you type messages back and forth with a Microsoft representative. Depending on the severity of your computer’s problem, though, it may move to a paid service. Schedule a Call, Call Me As Soon As Possible: These options provide variations on a common theme: paid support. Ask the Community: Perhaps your best bet, this involves posting your question in an online forum at answers.microsoft.com. Try the Online option first. Sometimes reading a website’s Frequently Asked Questions will clear up a common problem.